Today, some random moments from ChengDu & MianYang. Today ‘Neo’ took me to lunch at a nearby restaurant because he doesn’t have a Changhong employee cafeteria pass; he works for Vantron. So we strolled a few blocks away to one of those tiny classic Chinese restaurants which have no front façade, where the inside kind of spills onto the sidewalk. We feasted on the most savory Dan Dan mian (noodles) 担担面 — a most wonderful provincial specialty that’s got very umami spicy meat, the softness of the noodles, the counterpoint crunch of peanuts, and a light dusting of scallion. Saw this on a billboard just outside the factory. 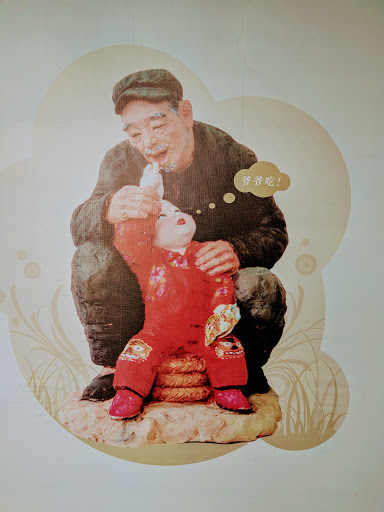 I have no idea what’s going on, nor what the kid is thinking, but something about this delights me. 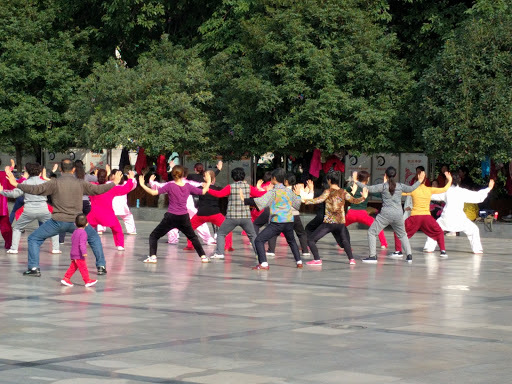 All over MianYang are public squares, and way many times every day the locals come out for exercise, dance, singing, and tai chi. Each neighborhood seems to have its own morale committee, getting people out and about and being together. Halfway between where the taxi drops me off and my hotel there’s a small space under the flyover. This lady is doing the screeching Chinese singing thing. I could hear it up in my room. 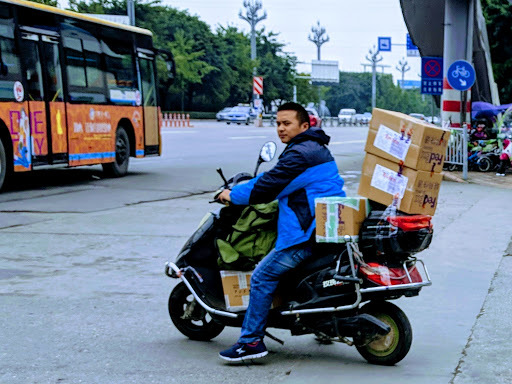 It’s one of the ways I know I’m in China. In the block around the MianYang train station are all these street food carts. It’s a very festive vibe, even though the poverty these simple carts are a struggle against is in plain view. There are a few different kinds of carts: fruits, fry bread, meat on a stick, Chinese soups. 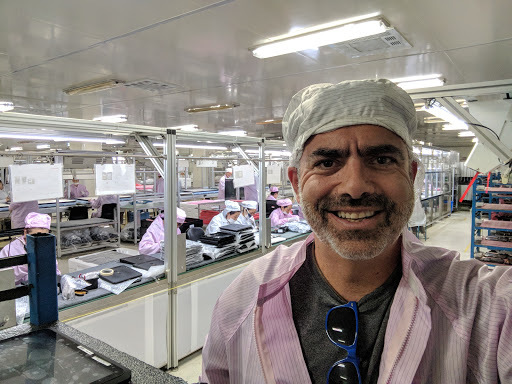 Me, in my clean room outfit, on the factory floor. It’s really hot in the plastic hat and coat, so I’m sipping water every few minutes. Last, the KFC in the ChengDuDong railway station. The Chinese LOVE their KFC, they’re all over the place. I haven’t looked at the menu, but I think that there are some traditional Chinese foods served. I think of you every time I see the KFC sign during my commute. 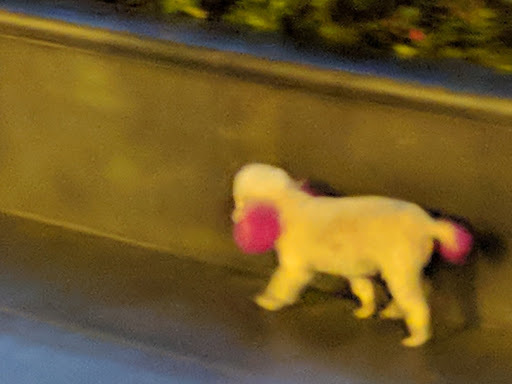 Okay, there’s a bunch of random moments in ChengDu & MianYang. I’ve been taking these pictures in lieu of you being with me on this trip. I hope you get a feel for what I see, what we’d see, and that it makes you happy.